Where did the name "strawberry" come from? Find the origin of the word strawberry here. Where did the name "strawberry" come from? The practice of mulching strawberry plants with straw, or the growth of the wild plants amongst matted hay or straw, led to the fruit being so strongly associated with straw. The practice in the past, in various European locales, of selling the fruit after it had been "strung" together on a piece of straw. The stolons ("runners") of the strawberry plant cause the plant/fruit to appear strewn over the ground. 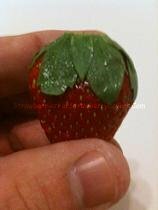 The color of achenes ("seeds") of many strawberries is the same as that of straw. the creation of the Fragaria ananassa strawberry hybrids, which are the strawberry varieties whose pronounced stolon formation and "straw"-colored achenes led to the previous etymological hypotheses (the woodland strawberry, Fragaria vesca, was the only strawberry variety ever in England prior to the use of the word "strawberry"). So, from a simple appeal to timing, it is clear that each traditionally-accepted origin of the word strawberry is incorrect. Dr. Sayers offers the following, on page 17: "The most plausible origin for strawberry in its earliest reference to the Woodland Strawberry is as a name for plants growing at ground level (like straw spread as litter) irregularly distributed as the result of the spread of achenes by birds and animals--two interrelated senses of being strewn." StrawberriesForStrawberryLovers.Com proposes another possibility for the origin of the word strawberry. From at least the time of Aristotle until well into the 17th century, there was a belief in an errant hypothesis called "spontaneous generation". According to this hypothesis, living things spontaneously formed from non-living things (i.e. flies from rotting meat, mice from garbage). While spontaneous generation may not have been widely known as a hypothesis, the basic belief was likely more commonly held. Now consider, too, that farm animals were allowed to graze in fields. In these fields, they not only ate grass, but anything else that they might come across, including wild strawberries. With these things in mind, one can imagine that the animals' manure occasionally contained strawberry seeds, and that when farmers found strawberry plants sprouting up from amongst their animals' straw (and manure), they easily assumed that the plants formed from the straw. Hence a "straw"-berry plant would have simply been a plant that spontaneously generated from straw. And even when the plant was sometimes found in the wild in the absence of straw, it may have been assumed that straw had been there previously, but that either all of the straw had converted to strawberry plants, or that any remaining straw had simply blown away. It is unlikely that anyone will ever have a completely convincing explanation for how the English name for our favorite fruit came to be. But it's still fun to think about!